Draft: 2012, Atlanta Braves, 2nd rd. Over the 2017 and 2018 seasons, his .714 winning percentage (25-10) ranks sixth (4th in NL) among the 72 Major League pitchers with at least 50 starts...in the same span among that group, his 3.20 ERA ranks 12th (6th in NL) and his 1.12 WHIP is 14th overall...in 2017 was a National League All-Star, the NL Pitcher of the Month for May and the NL Pitcher of the Week for 5/8-5/14...also in 2017 finished ninth in the Baseball Writers' Association of America's National League Cy Young Award voting after posting a career-high 16 wins and career-low 2.72 ERA...has made 16 career Postseason apps, including 2 starts, covering 3 Division Series, 3 League Championship Series and the 2017 & 2018 World Series (1-2, 4.10, 26.1ip, 22h, 16r, 12er, 8bb, 28k, 9hr)...was the winning pitcher in the longest game in World Series history...pitched a scoreless 18th inning of the 3-2 Dodgers victory in 2018 Game 3 vs the Red Sox...in Game 4 of the 2017 World Series vs the Astros at Minute Maid Park threw 5.2 innings before he allowed a hit, the longest no-hit bid by a Dodgers pitcher in World Series history...received no decision in that 6-2 Dodgers win (5.2ip, 1h, 1er, 2bb, 3k, 1hr)...in his career is 47-38, 3.33 in 129 starts and 5-2, 2.70 in 43 relief apps. Attended the University of Georgia, where in 2012 he was named second team All-SEC after going 7-3, 2.73 in 15 starts and 1 relief appearance...his 2.73 ERA was the best by a Bulldogs starter since Dave Fleming in 1989...was named to the 2012 UGA Athletic Director's Academic Honor Roll...at Georgia was a teammate and roommate of C/IF Kyle Farmer...follow on Twitter @AWood45. Led the Dodgers with 27 starts (8-7, 3.65), all in his first 27 apps of the season...beginning 9/17 made his last 6 apps of the season in relief (1-0, 4.91)...went 1-1, 5.40 in 9 Postseason apps (6.2ip, 8h, 4er, 4bb, 9k, 3hr)...pitched in the Division Series vs the Braves (2g), in the League Championship Series vs the Brewers (4g) and in 3 of the Dodgers' 5 World Series games vs the Red Sox...was the winning pitcher in the longest game by innings and by time in World Series history (18 innings & 7 hours, 20 minutes)...in Game 3 vs the Red Sox at Dodger Stadium, as LAD's ninth pitcher of the game threw a scoreless 18th inning to earn that 3-2 win...Max Muncy won it for the Dodgers in the bottom of the 18th on a solo walkoff HR off Nathan Eovaldi, who as the Red Sox' ninth pitcher allowed 3 hits and 2 runs in 6.0 innings in relief. In 27 games (25 starts), he collected a career-high 16 wins and posted a career-low 2.72 ERA (46 ER/152.1 IP) in his third season with the Dodgers…struck out 151 batters against 38 walks, while posting a 1.06 WHIP ... Held hitters to a .217 average, including a .213 mark against right-handed hitters…limited the opposition to a .186 average with runners on-base and a .167 mark with runners in scoring position ... Made 25 starts (15 quality starts) and went 15-3 with a 2.82 ERA (46 ER/147.0 IP) and held hitters to a .224 average... despite beginning the season in the bullpen, he ranked among big league starters (min. 125.0 IP) in wins (T-12th), ERA (6th), WHIP (1.09, 8th), opponents' OPS (.639, 9th), opponents' OBP (.281, 9th), home runs allowed per nine innings (0.92, 12th) and opponents' batting average (17th) ... Started the season 11-0 (April 15-July 15), becoming just the 19th pitcher since 1913 to start a season 11-0 or better and the first since Stephen Strasburg in 2016 (13-0)…his 11-game winning streak was also the second longest streak in the big leagues this season, trailing teammate Clayton Kershaw's 12-game streak ... Made 14 consecutive starts without a loss from April 10-July 15, which was the longest stretch by a Dodger since Rick Rhoden, who went 19 straight starts without a loss in 1976…during that stretch, he went 10-0 with a 1.66 ERA (15 ER/81.1 IP) and limited hitters to a .183 average, while striking out 97 batters against 22 walks ... According to Stats LLC., he allowed one or fewer runs while pitching at least 6.0 innings in six consecutive road starts (April 26-August 3), the longest such streak in a single season in Dodgers history since 1913…only three other ML pitchers over the last 20 seasons have pitched 6.0 or more innings while allowing one or fewer runs in at least six consecutive road starts in one season: Johan Santana (seven straight in 2004), Ubaldo Jimenez (seven straight in 2010) and Luis Severino (six straight in 2017) ... Selected to his first All-Star game in his fifth big league season and also finished ninth in the NL Cy Young voting ... Named the NL Pitcher of the Month for the month of May after going 5-0 with a 1.27 ERA (4 ER/28.1 IP) in his five May starts, ending the month with a run of 25.1 scoreless innings - had his scoreless streak come to an end at 27.1 innings on June 10, which was the third longest scoreless innings streak in the Majors in 2017…it was his firstcareer monthly award…also claimed his first NL Player of the Week Award for the period ending May 15 ... Made two stints on the disabled list with a SC joint inflammation (May 29-June 10 & Aug. 22-Sept. 3), missing a total of 24 games ... 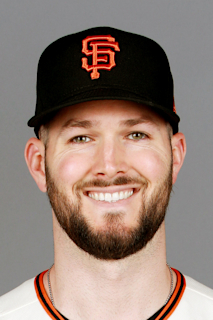 Appeared in three games (two starts) in the postseason, going 0-1 with a 2.92 ERA (4 ER/12.1 IP) and limited batters to a .122 average…struck out 13 against just two walks in 12.1 innings…had a no-hit bid through 5.2 innings against the Astros in Game 4 of the World Series, which marked the longest no-hit bid in WS history by a Dodger pitcher. Combined to win a career high 12 games, going 12-12 with a 3.84 ERA in 32 combined starts with the Dodgers and Braves…also set career highs in starts (32) and innings (189.2). ... Opened the season with the Braves, going 7-6 in 20 starts with a 3.54 ERA, striking out 90 batters against 36 walks in 119.1 innings. ... Acquired by the Dodgers on July 30 along with right-handed reliever Jim Johnson, left-handed reliever Luis Avilan, minor league infielder Jose Peraza and right-handed pitcher Bronson Arroyo from Atlanta in exchange for infielder Hector Olivera, left-handed reliever Paco Rodriguez and minor league right-handed pitcher Zack Bird. ... Posted a 5-6 record with a 4.35 ERA in 12 starts as a Dodger, including a 3-2 record with a 2.41 ERA (9 ER/33.2 IP) in five starts at Dodger Stadium. ... Limited lefties to a .223 batting average (39-for-175), a .243 on-base percentage and a .274 slugging percentage…with runners in scoring position, held hitters to a .226 batting average (36-for-159). ... Had arguably the best start of his career on Sept.16 against the Rockies, allowing only one hit and needing only 78 pitches to breeze through 8.0 scoreless innings, which tied a career high for the fifth time. ... Allowed just 15 home runs in 189.2 innings, posting a 0.71 home run per nine innings ratio, which ranked 14th in the National League (min. 100.0 innings pitched). ... Made one postseason appearance, allowing four runs on four hits in 2.0 innings of relief in Game 3 of the NLDS vs. the Mets. Entered 2013 as Atlanta's seventh-best prospect, according to Baseball America...Was also rated as the player closest to the majors in the Braves' 2012 draft class...Had his contract purchased on 5/30 andmade his MLB debut that night vs. TOR by tossing a scoreless ninth inning to preserve the 11-3 win...Madehis first MLB start on 6/18  vs. NYM, allowing one run over 3.0 innings (5 K) and earned his first career Major League win in his start on 7/30 vs. COL...Went 3-2 with a 3.54 ERA in 11 games as a starter...In 20 relief appearances, he went 0-1 with a 2.08 ERA...Nine of his 11 starts came against teams from the NationalLeague East division...Went 2-0 with a 0.90 ERA in five starts during the month of August...He held batters to a .190 average and fanned 28 in 30.0 IP...Returned to the bullpen 9/22 at CHI (0.2 IP) after a stretch of 10 starts, from 7/25 to 9/18...Over 11 minor-league games between Mississippi (Double-A) and Gwinnett (Triple-A), combined to go 5-2 with a 1.31 ERA while striking out 62 and walking just 11 in 62.0 IP...Was named Southern League Pitcher of the Week for 4/22-28...Had a scoreless innings pitched streak of 32.0 IP (a Mississippi Braves record) from 4/12-5/14, a span of seven starts. Went 4-3 in 13 starts in his first season as a professional for Single-A Rome, posting a 2.22 ERA and striking out 52 batters against 14 walks in 52.2 innings ... Led Rome starters in ERA and led all Rome pitchers with a 1.06 WHIP. March 28, 2019 Cincinnati Reds placed LHP Alex Wood on the 10-day injured list retroactive to March 25, 2019. Back injury. August 14, 2018 Los Angeles Dodgers activated LHP Alex Wood from the 10-day disabled list. August 4, 2018 Los Angeles Dodgers placed LHP Alex Wood on the 10-day disabled list. Left adductor tendonitis. September 3, 2017 Los Angeles Dodgers activated LHP Alex Wood from the 10-day disabled list. August 22, 2017 Los Angeles Dodgers placed LHP Alex Wood on the 10-day disabled list. Left SC joint inflammation. June 10, 2017 Los Angeles Dodgers activated LHP Alex Wood from the 10-day disabled list. May 29, 2017 Los Angeles Dodgers placed LHP Alex Wood on the 10-day disabled list retroactive to May 27, 2017. Left SC joint inflammation. October 15, 2016 Los Angeles Dodgers activated LHP Alex Wood. October 7, 2016 Los Angeles Dodgers reassigned LHP Alex Wood to the minor leagues. September 20, 2016 Los Angeles Dodgers activated LHP Alex Wood from the 60-day disabled list. June 29, 2016 Los Angeles Dodgers transferred LHP Alex Wood from the 15-day disabled list to the 60-day disabled list. Soreness in left triceps. July 31, 2015 Los Angeles Dodgers activated LHP Alex Wood. June 25, 2014 Atlanta Braves recalled LHP Alex Wood from Gwinnett Braves. June 10, 2014 Atlanta Braves optioned LHP Alex Wood to Gwinnett Braves. July 25, 2013 Atlanta Braves recalled LHP Alex Wood from Gwinnett Braves. July 13, 2013 Atlanta Braves optioned Alex Wood to Gwinnett Braves. May 30, 2013 Atlanta Braves selected the contract of Alex Wood from Mississippi Braves. March 29, 2013 Alex Wood assigned to Mississippi Braves from Rome Braves. January 10, 2013 Atlanta Braves invited non-roster LHP Alex Wood to spring training. September 24, 2012 Alex Wood roster status changed by Rome Braves. September 1, 2012 Rome Braves placed LHP Alex Wood on the 7-day disabled list. June 20, 2012 LHP Alex Wood assigned to Rome Braves from Atlanta Braves. June 19, 2012 Atlanta Braves signed LHP Alex Wood.